Have you seen those red and blue lights flashing in your rear-view mirror lately? If you want to keep your record clean, it’s good to know what cops are looking out for on the roads in Texas. A recent article on PopularMechanics.com by Phil Berg gave some interesting insight into why you might get pulled over in Texas. In “Confessions of a Traffic Cop,” Berg interviewed retired police officer Mike Bukus, who shed some light on some of the most common traffic violations. We took Berg’s suggestions as well as our own observations of safe driving techniques and created this hit list of the 5 most common traffic tickets in Texas. Speeding: Speeding is the most common moving violation in the country, with approximately 100,000 drivers receiving speeding tickets per day. According to the National Safety Council, it is the cause of one in three accidents in the U.S. So it’s no wonder cops nationwide put speeding at the top of their target ticketing list. With speed limit signs posted everywhere from highways to residential streets, it’s also the most obvious one for us to avoid. The National Motorists Association , a driver advocacy group, has put Texas as one of the top 5 states where you’re most likely to get a speeding ticket. Keep this in mind when you feel your foot getting heavy on the accelerator. Seatbelts and Child Car Seats: In Texas, everyone inside your vehicle needs to be belted in. Until recently, passengers in the back seat were exempt, but Sec. 545.413 of the Texas Occupant Restraint Law was amended to include all passengers in all seats. So those back seat drivers had better be wearing their seatbelts! In addition, children eight and younger must be secured in a federally-approved restraint seat, unless the child is at least four feet, nine inches in height. With heightened efforts put into their “Click it or Ticket” public safety campaign, you can be sure Texas cops are on the lookout for seat belt violations. Cell Phones: If you drive in Texas, you could be facing a wide range of laws restricting cell phone use. Approximately 25 Texas cities have adopted an ordinance banning texting while driving. In addition, some areas have restrictions on the use of hand-held cell phones or other electronic devices. And, in November of last year, Texas House Bill 63 was introduced by Rep. Tom Craddick (Midland) to the state legislature, proposing a statewide ban on texting and driving. No matter where in Texas you are, all drivers are banned from texting in school zones, and novice drivers are banned from hand-held cell phone use altogether. As this law is constantly evolving, your best bet to avoiding a ticket in Texas is to just put your phone down and keep your hands on the wheel. Running a Red Light: Even if you don’t see a cop behind you, you could still get a ticket for running a red light in Texas. The Lone Star State is one of 24 in the union with red light cameras currently in use. Regardless of whether you’re spotted by a cop or the all-seeing eye of a camera, red light tickets can be annoying and costly. In case you aren’t aware, the national legal blood alcohol limit for drivers is .08%. In the state of Texas, your driver’s license implies consent to a breath or blood alcohol test. If you’re stopped on suspicion of DUI and you refuse the request for a test, your driver license will be suspended on the spot for 180 days. It’s also worth mentioning that your first DUI offense in Texas can cost you $2,000, at least 90 days license suspension, and minimum of 3 days in jail. 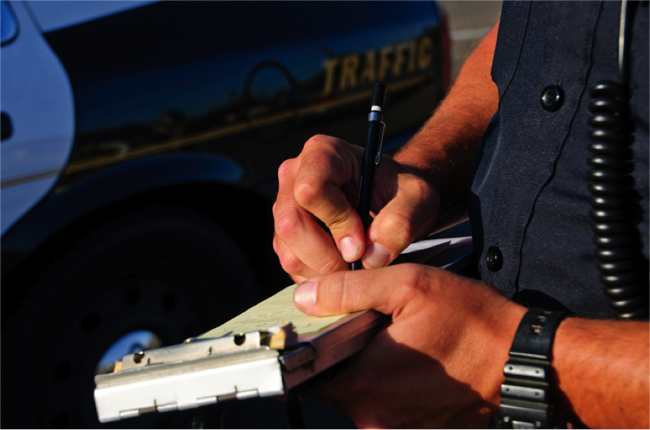 These are just a few of the most common ways you could get a ticket in Texas. If you want to brush up on traffic laws, try signing up for an online Texas defensive driving course —it’s a great way to ensure you’re safe and confident behind the wheel.